Kalasipalyam -a place busting with people, traffic, not to forget cows! Not an inch of space at this crowded site, yet bang in the middle there is silence. A silence that astonishes you, for you don’t expect to find it in this cacophony. Yet it is there, thanks to the strong stone fort 500 years or older standing here. You enter the fort, pass the huge wooden gate and lo- a sense of calm descends. 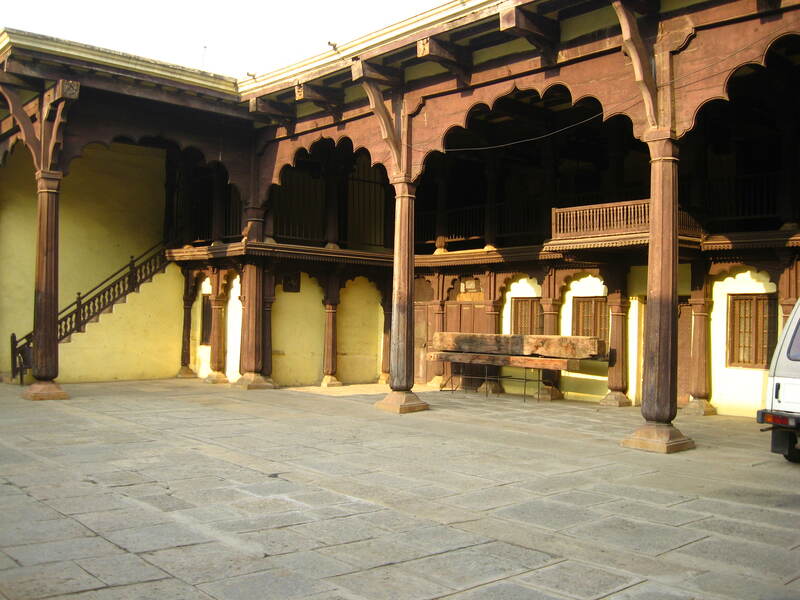 The thick walls of the fort reflect the outside sound – only silence and an inherent sense of peace greets you inside. From ancient times forts have been defensive structures protecting the city and its inhabitants. 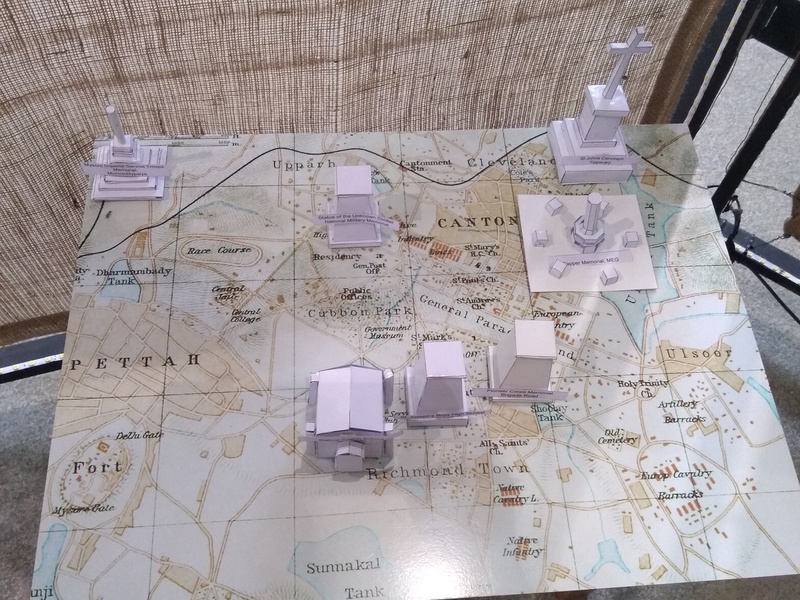 The kings used it to mark boundaries, protect treasury, royal family; the powerful zamindars used it for protecting their property … They served as excellent places to hide as well. It was difficult to enter these premises- the surrounding moat, ditch or bush of thorns around fort making things tougher for such attacks. There were different categories of forts. 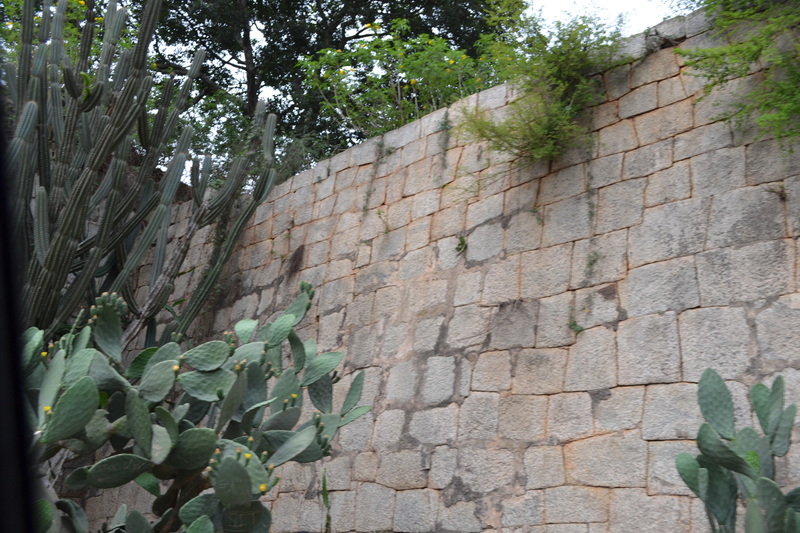 The one at Kalasipalyam and the interconnected fort for the old city or Pete was a city fortress surrounded by a moat and had thorny bushes all around it making the city invincible. 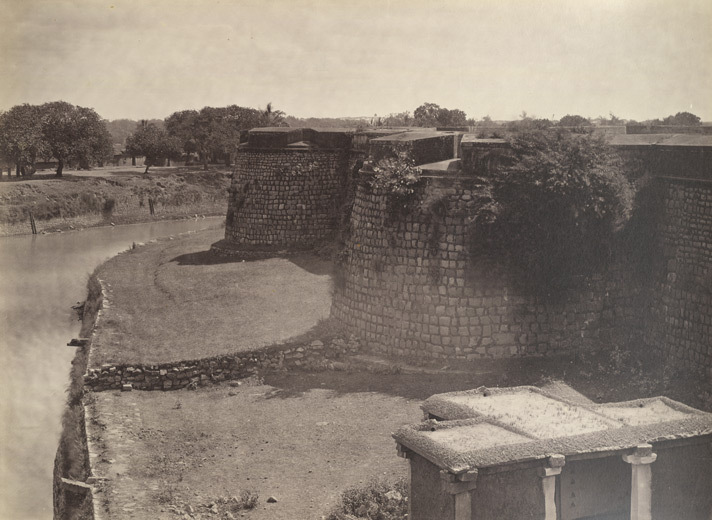 It was a mud fort before transforming in to a stone fort, complete with bastions after Hyder Ali and later Tipu Sultan came in to power. But not all forts were built like this. 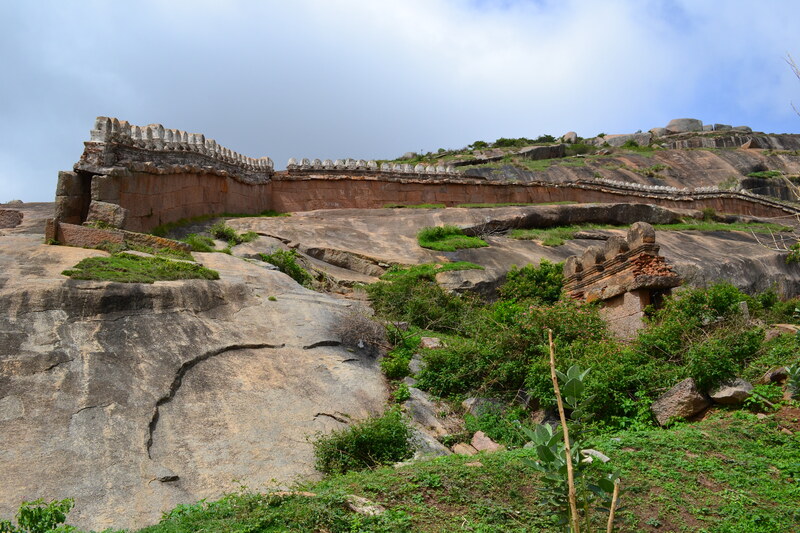 At Savandurga, Nandi hills,Shivganage outside the city –the forts were parvat durg or giri durgs. 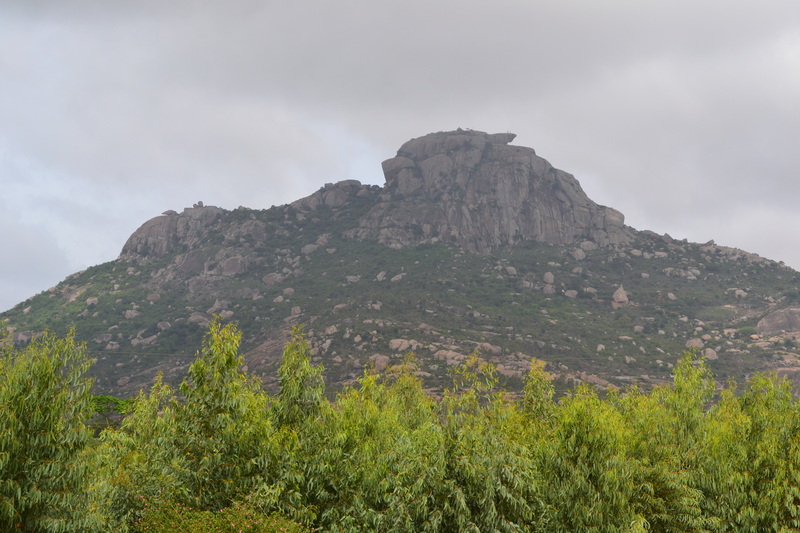 The forts were located on high hills- the boulders, the rocky outcrop making things tougher. Battlements, bastions, loop-holes were other strategies to make the fort invulnerable. 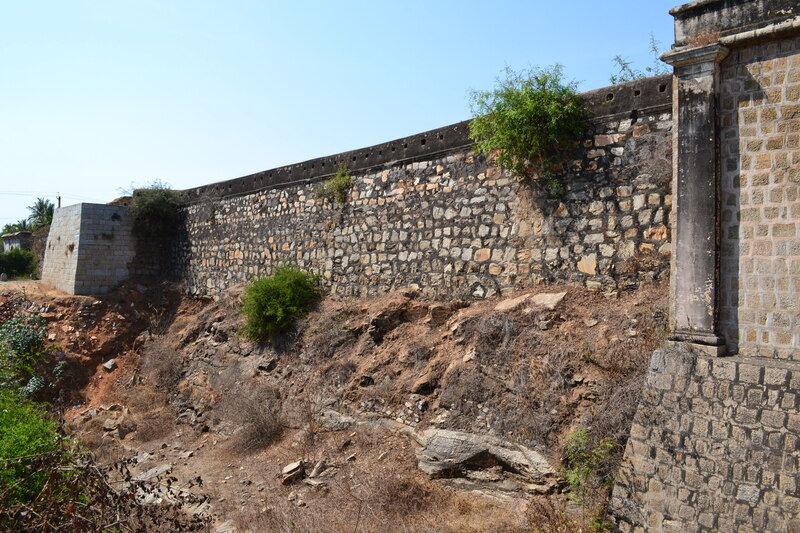 Even today the walls, bastions and towers remain on the durg perhaps telling the stories of sieges and battles. 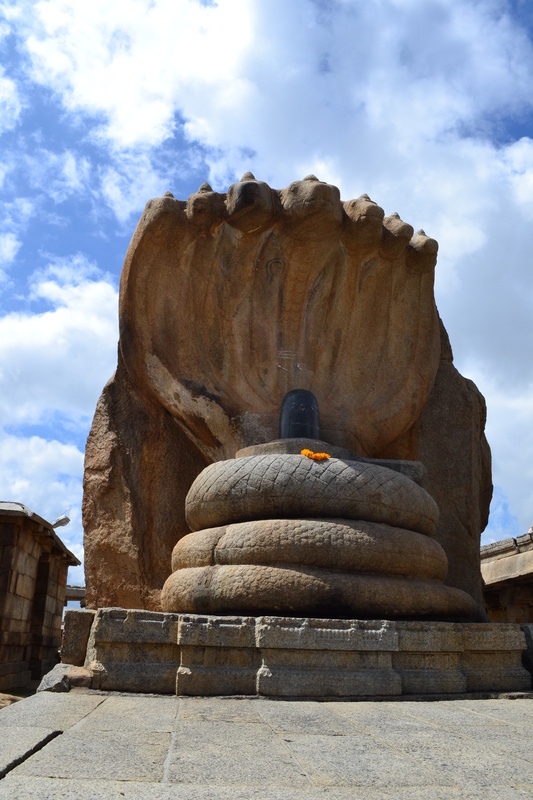 A trek at Savandurg or Shivgange makes you aware of this. The slopes, the steep ascents, the bastions at regular intervals- makes you aware of the planning gone behind building such forts. 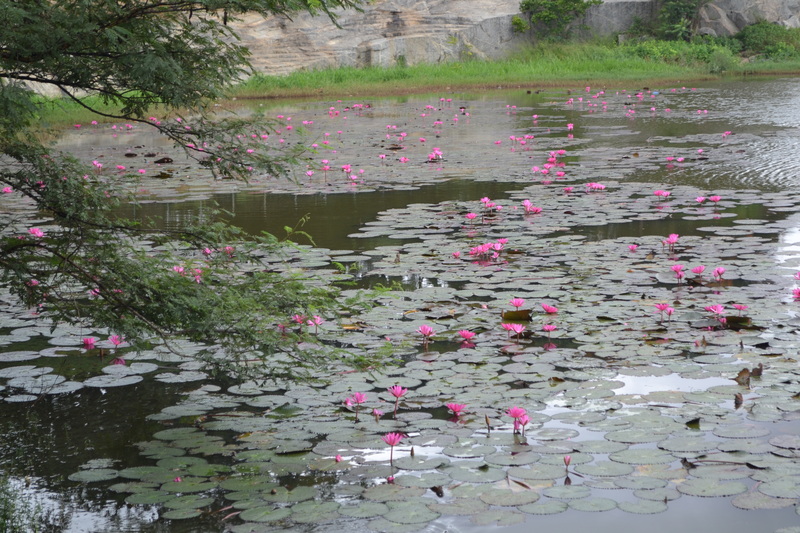 Srirangapatna –the harbour of Tipu was an excellent Nadi-Durga/Jal durg. 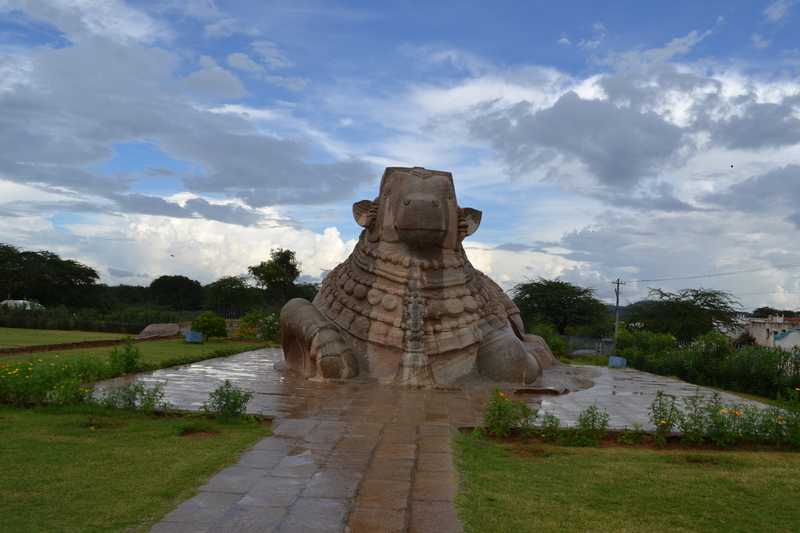 The city was on an island surrounded on all sides by Kaveri. And during monsoons when the river was in full, the fort would become impregnable. Natural and artificial defence strategies were effectively used here as well. There were other fort types as well- dhanva durg, vana durg, nara durg etc. While dhanva durg was protected by desert, vana durg was surrounded by forests, nara durg by strong men etc. The toppling of fort was not just victory to the enemies or the replenishment of supplies. It also meant breaking the morale of the enemy camp. 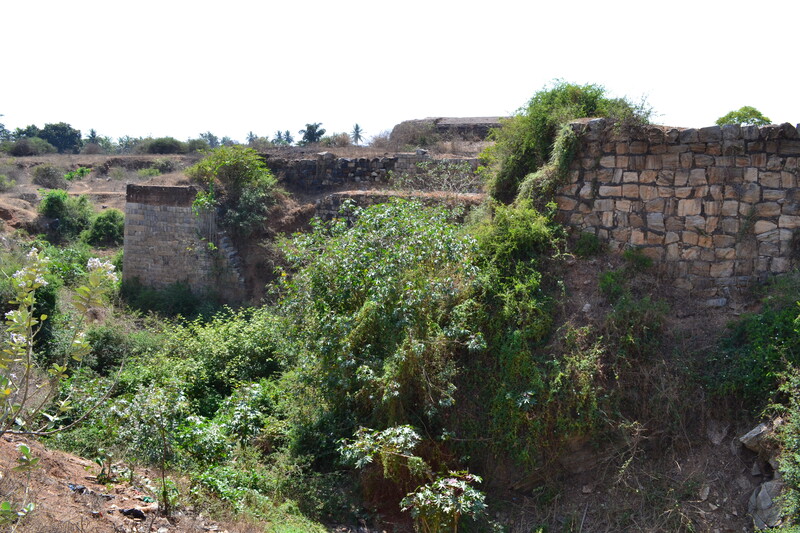 The capture of Bangalore fort by the British was a blow to Tipu’s army. Most of the forts came in to the hands of the English after this decisive victory. 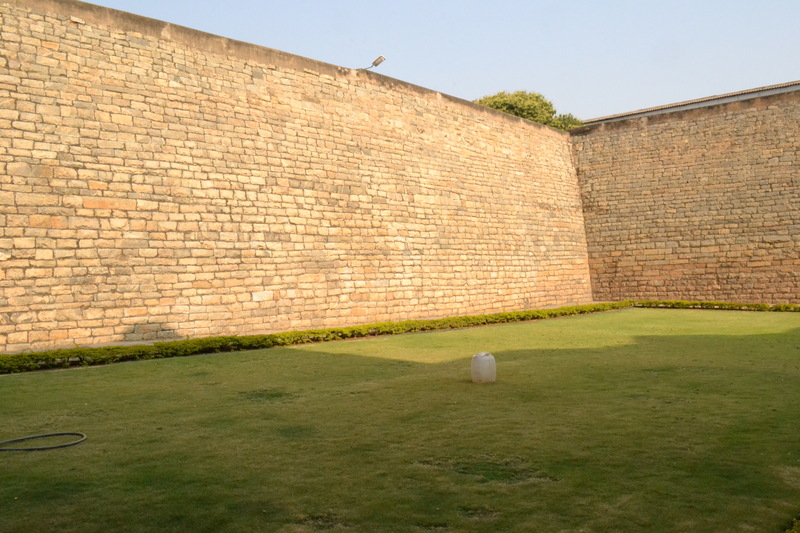 Today what remains of this oval fort that once protected the palace, armoury, treasury etc. is just two and a half bastions and a gateway. But it does its job- retelling history effectively. We had a gala time last Sunday with Nestaway. 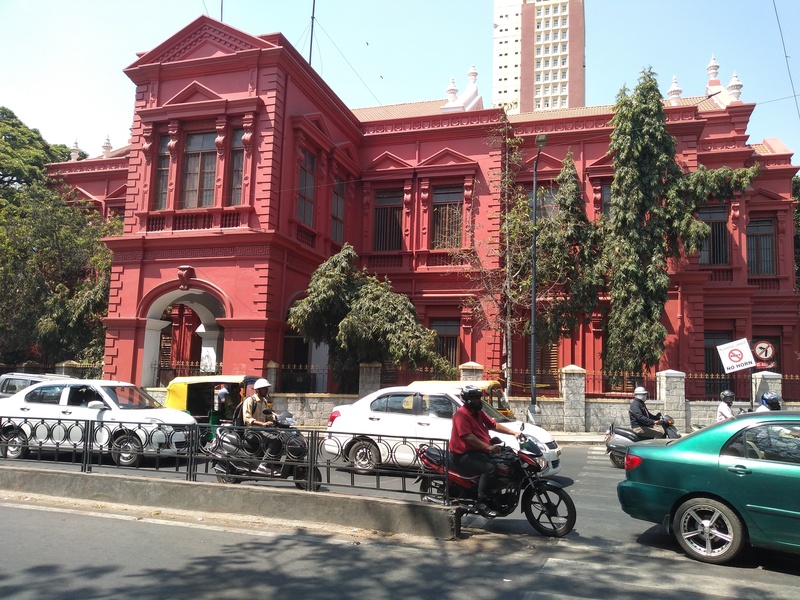 Some 27 walkers joined us on a Sultan Tour to understand Tipu Sultan-King Of Mysore a bit. 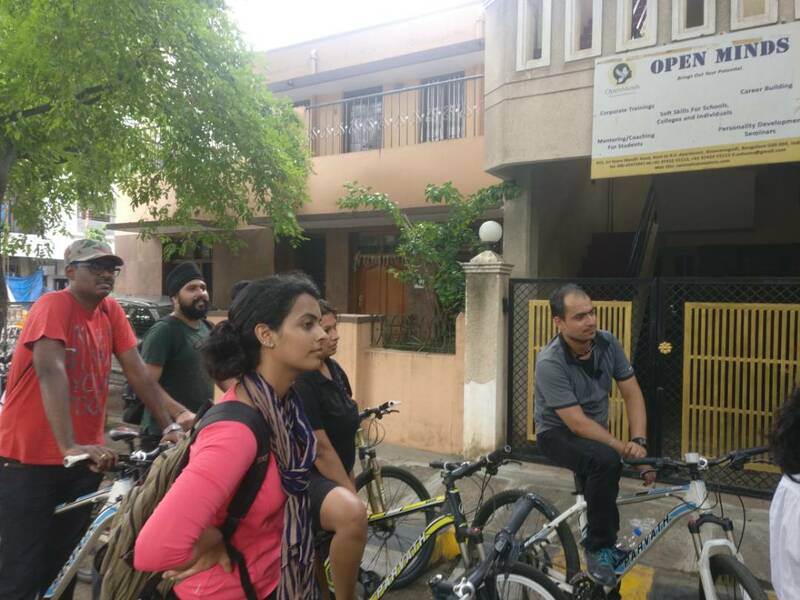 The half a day tour encompassed cycling and walking through some beautiful hidden places of Bangalore. 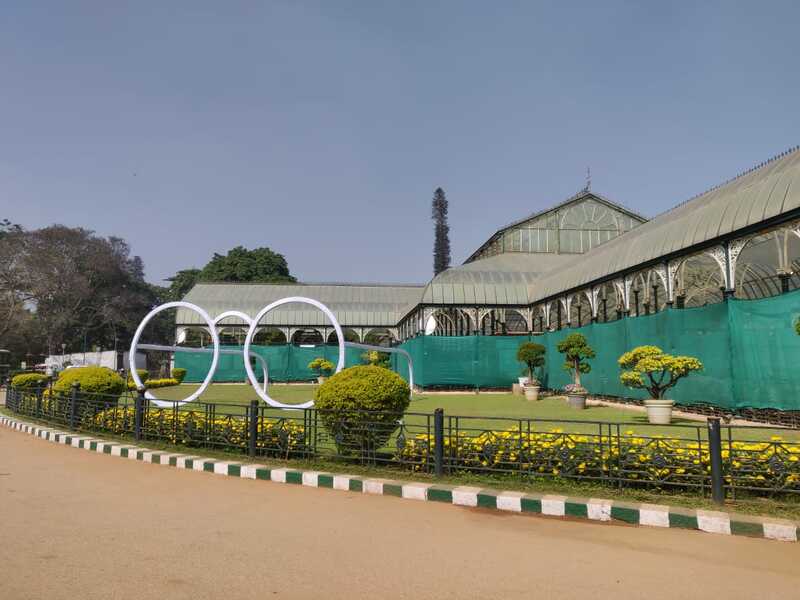 After a brief stop over at the Summer Palace where the participants came to know the life and times about the ruler, his ingenious warfare methods like the beloved Tipu’s rockets ,they then headed out to Tipu’s armoury at Kalasipalyam. Tipu built ten armouries during his time, most of them at Srirangapatna. 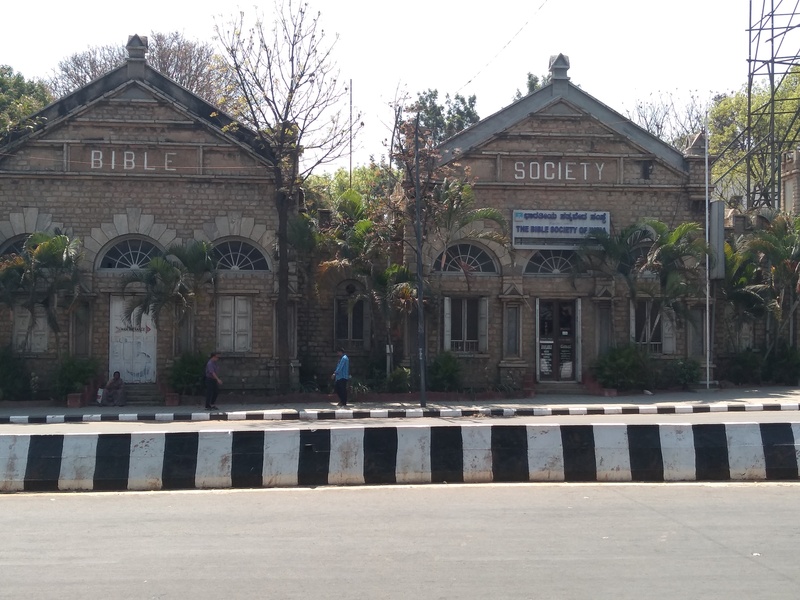 The one in the city is more than 200 years old. Pity it is not in a great shape. “People were playing cards here. The yesteryear ammunition dump has now become a garbage dump with plastics, bottles all thrown around,” said Arman a Nestie. 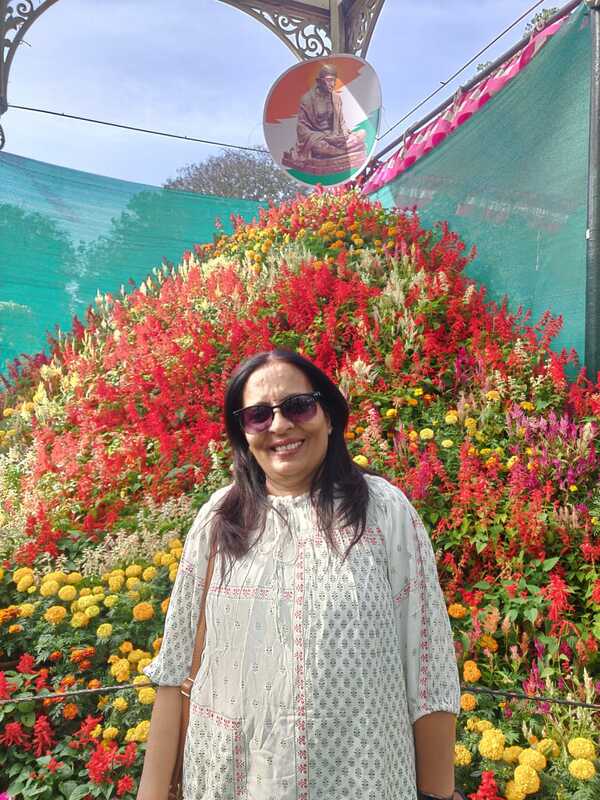 The next pitstop was at Siddapura Nursery where the green thumb of everyone became visible. After a refreshing hob -nob at the nursery, some came back armed with saplings to tend them at home. 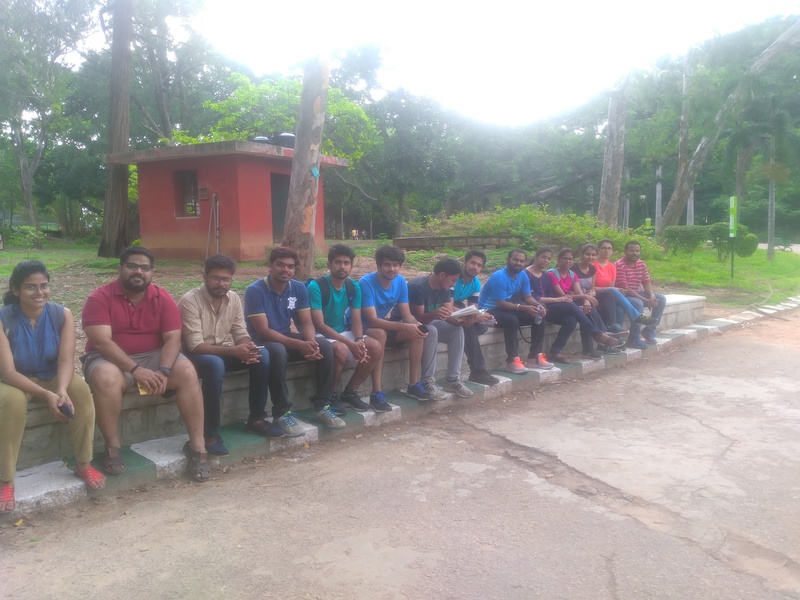 We then cycled back to Lalbagh. 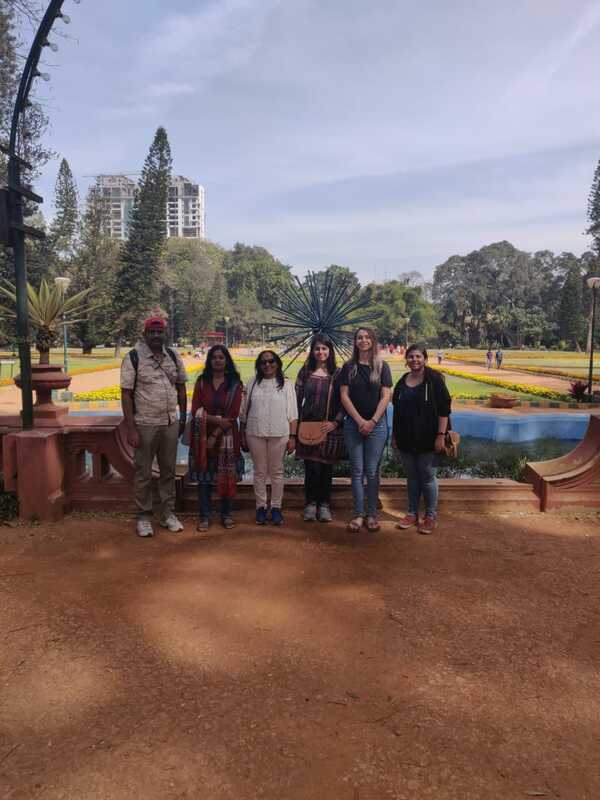 A two hour unhurried walk at Lalbagh gave the walkers a glimpse of the times of Hyder and Tipu and their passion for horticulture. 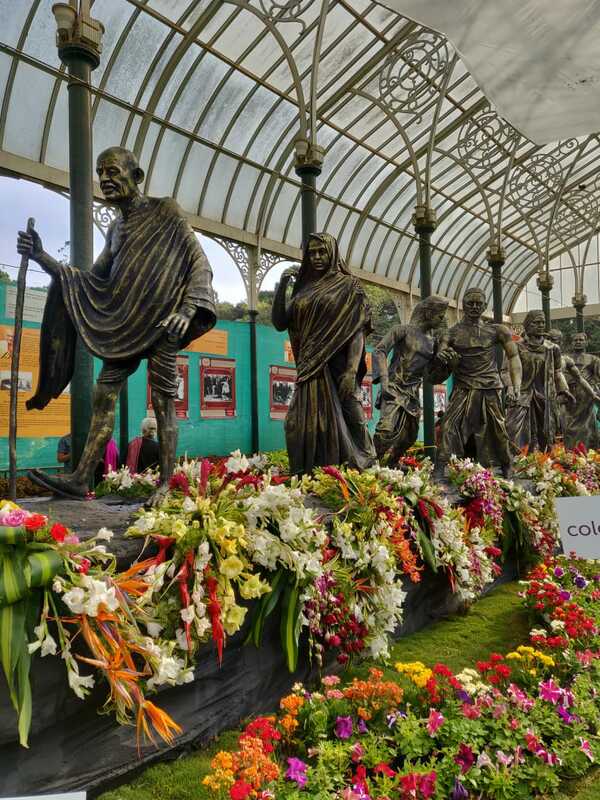 The once 40 acre garden due to the interests of these rulers and the vision of the British superintendents who came after them has today blossomed in to a 240 acre park with more than 1858 species of plants. 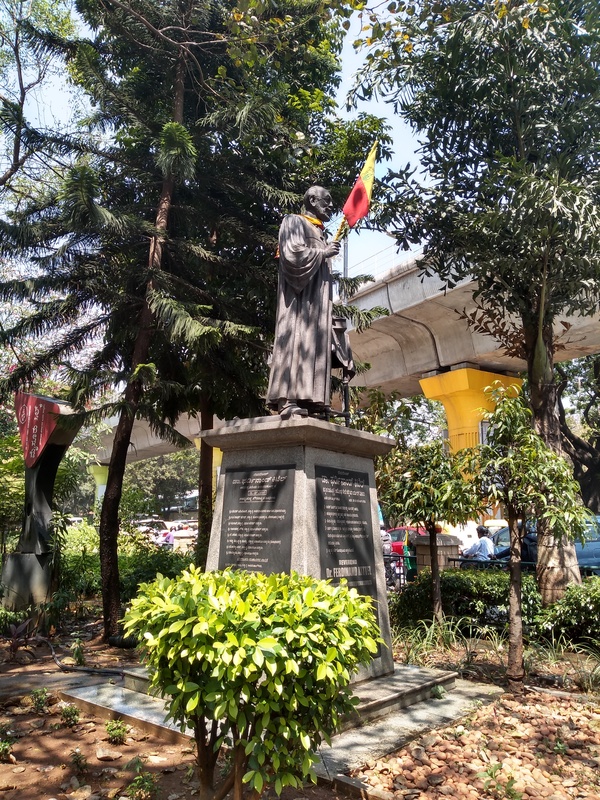 While there was a sense of awe standing beneath the majestic Silk Cotton Tree, and amazement looking at the 400+ old Kempegowda’s watch tower, there were sniggers while passing by Rain tree, when the walkers understood how it got the name. The walk was fruitful. 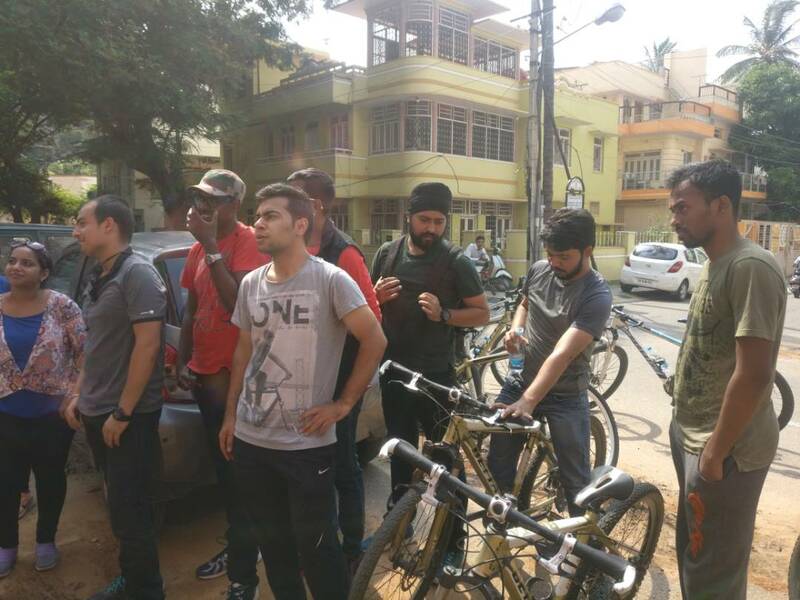 The participants from all over India- Jammu,Allahabad,Kanpur,Nagpur,Kerala,Hyderabad etc got a glimpse of the Bangalore past. 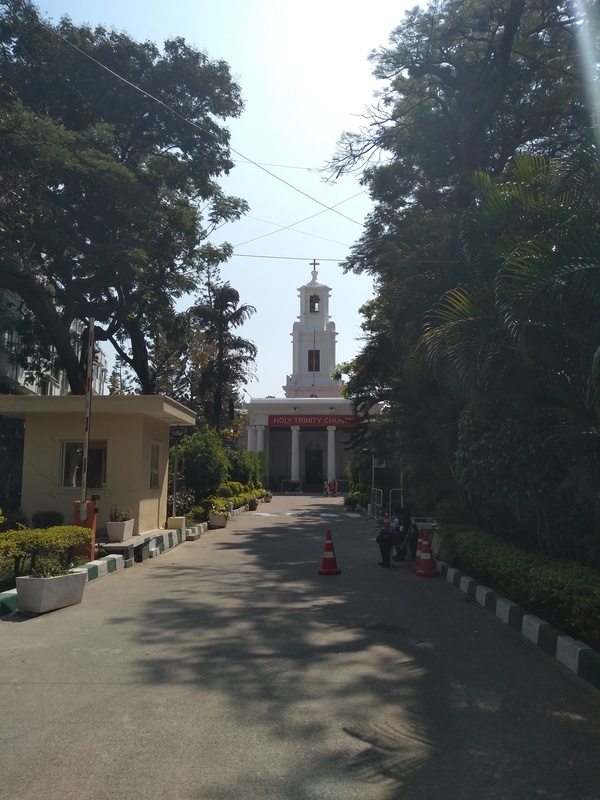 Mavalli Kere made them recollect the existing lakes in the city. 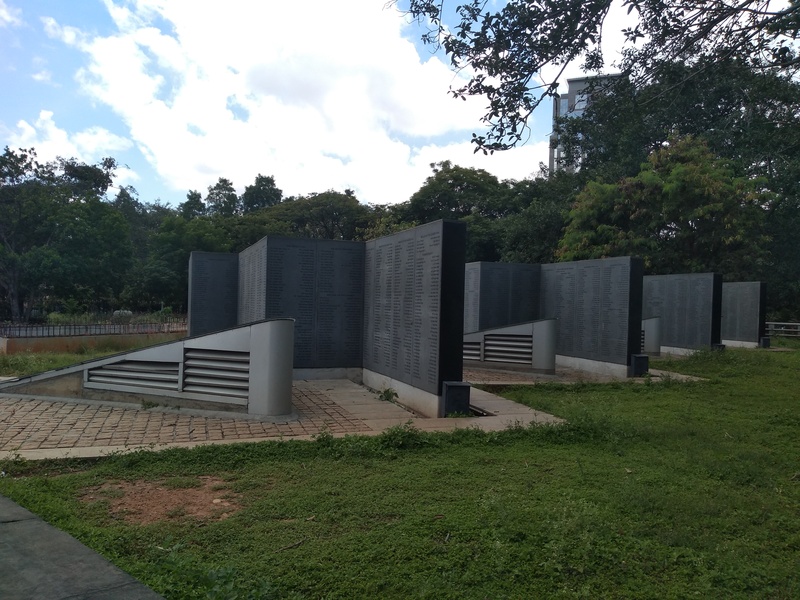 When they realized that Bangalore hosted 262 lakes in 1960 and now it had dwindled to 34 lakes there was a sense of loss. Why was it called Pensioner’s paradise? 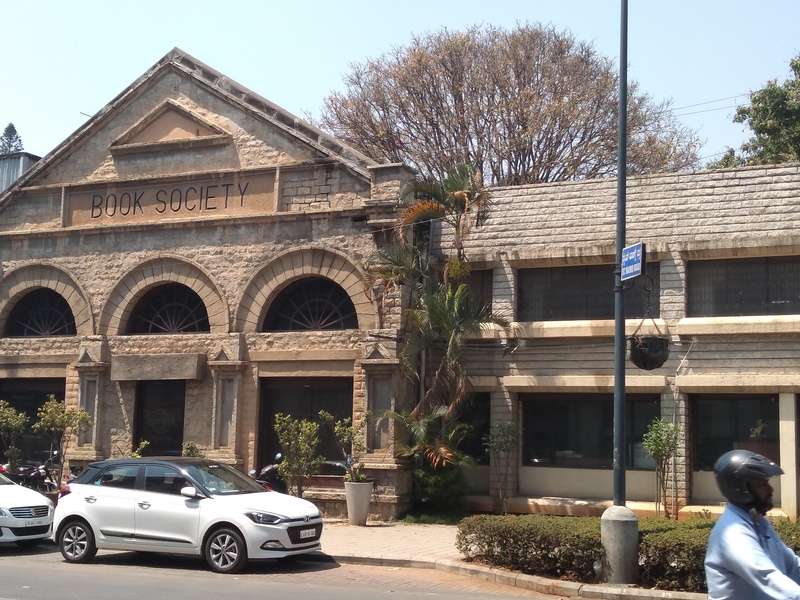 What led to the unplanned growth in the city? These were some interesting questions that popped up after this. 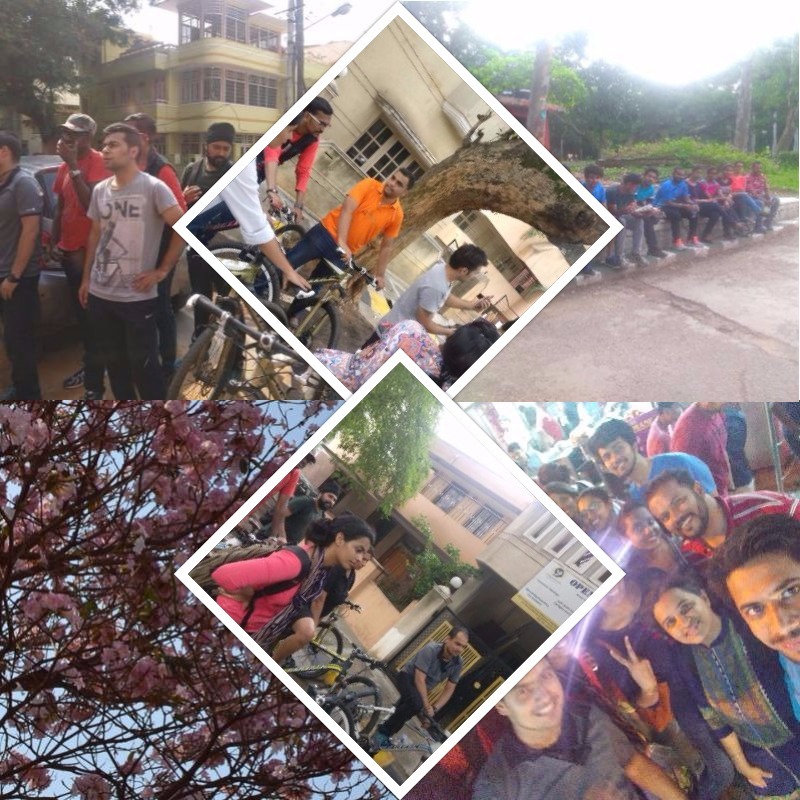 After this action packed tour, we reached VV Puram Chat Street to fill ourselves. The yummy masala dosa,the spicy curd kodubale and sinfully wicked Gulkand ice cream more than made up for our tiredness. If you would like to join in the fun then why not book a city walk with us? As I walk through the rain glistened paths of Lalbagh, I recollect a few lines from the poem ‘The Rain’ by William Henry Davies. An apt poem to recall don’t you think, when taking an unhurried walk through the botanical garden? The wet season is here and so are the sweet smelling Sampige, Akash Malige, Parijata and the Basavanapada. 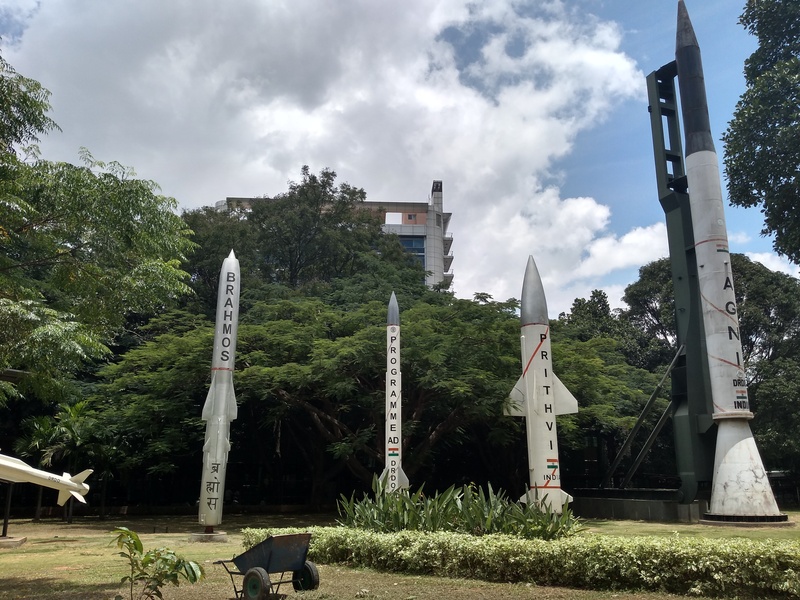 Though there are the occasional stray blossoms of red Gulmohar and Jacaranda still in the park, they will soon fade away to be replaced by these fragrant species. 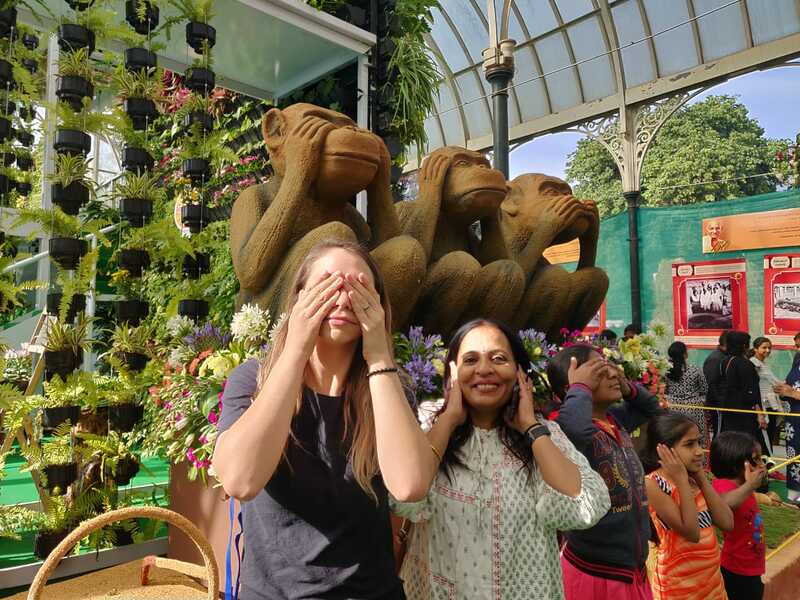 Whether it is the rosy hues of Basavanapada or the silvery Akash Malige, their divine scents and blooms will stop you on your tracks at Lalbagh and that’s a promise. For the uninformed here are few pointers to help you locate these monsoon flowering blossoms. Champa, Chompa, Sonachampa,Sampige(Magnolia champaca) call it by any name, this native tree cannot be missed. With both white and yellow varieties, this scented flower is used in Pooja offerings. 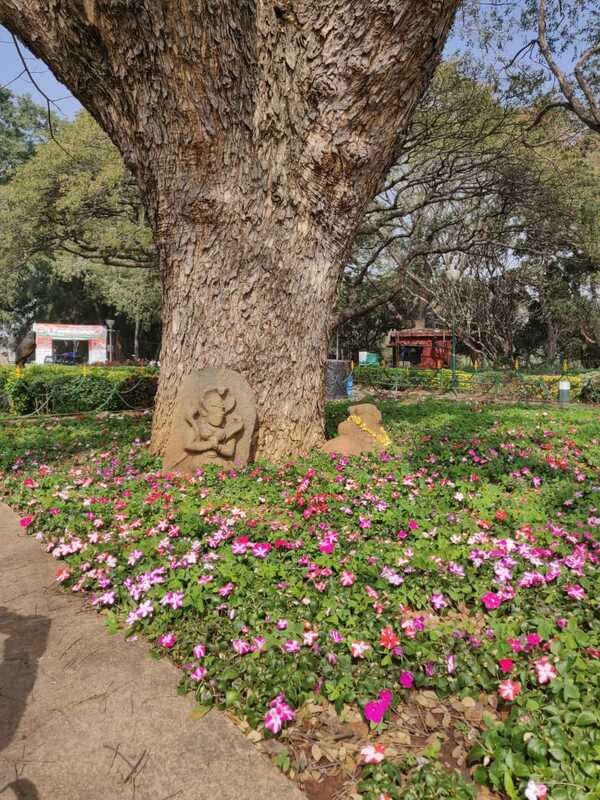 It is also one of the flowers of God Kamadeva(cupid) and so you could do well to declare your love beneath these trees. Akash Malige, Neem Chameli, Indian Cork Tree(Millingtonia);the bell shaped white flowers grouped in clusters is a sight worth watching. The bark of this tree is used to make cork,hence the name cork tree. If you frequently suffer from colds this tree is worth sniffing. After all the flower buds are used in the treatment of Asthma and Sinusitis. 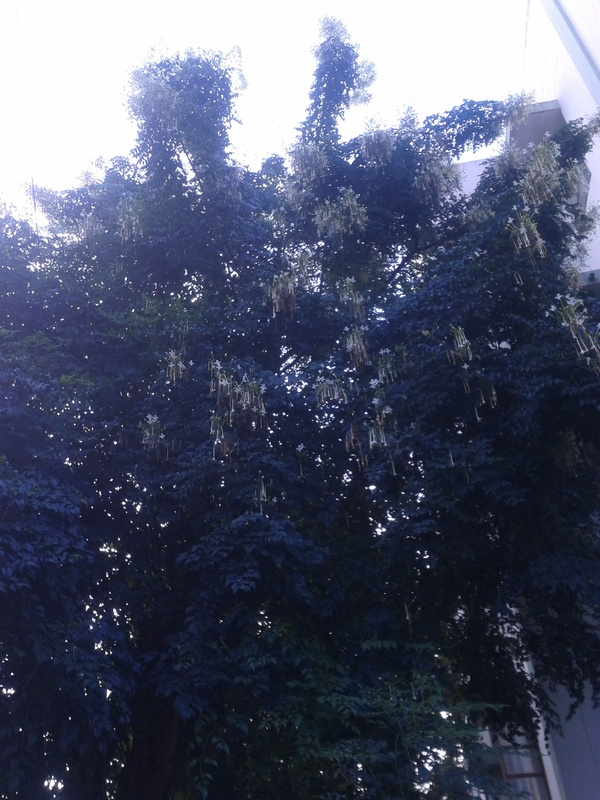 This is another tree that cannot be missed-Parijata(Nyctanthes arbor-tristis) also known as the Tree of Sorrow are sweet smelling white flowers with orange center. 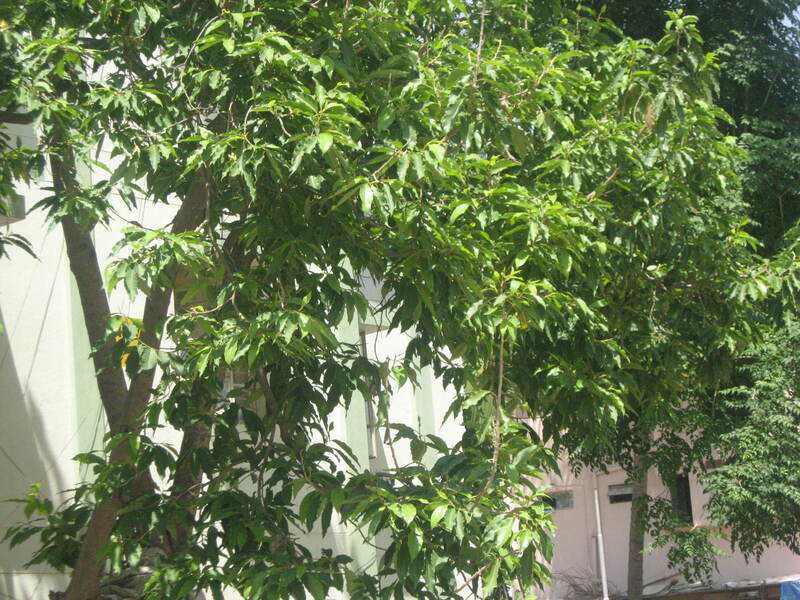 It is a divine tree said to have been brought down from heavens by Lord Krishna. Bull’s hoof, Camel’s foot, butterfly,Basavanapada, Mandira Pushpa(Bauhinia)- the tree goes by many names. The shape of the leaf gives you a clue to its name Basavanapada or Bull’s hoof. Pink,rose,white, lavender-the flowers come in various colors. This flower is also a popular offering to Lord Ganesha during Ganesh Chaturthi festival.